The company Lehr Outboard, using its patented technology, continues to expand the range of outboard engines for gas. According to the company's specialists, there are two reasons to use propane (110 octane number) as fuel: environmental and functional. And, if everything is clear at once with the purity of nature, then the engineers explain the functional component by the fact that water cannot get into propane, which is under pressure in a cylinder, like a gas canister. This is a really important argument affecting water safety. It should be noted that although Lehr developed its own technology, they were not pioneers in the field of powering compact engines with gas. In 2011, for example, Fiskars specialists, after a series of tests, discovered that the vibration of their engine could lead to wear of the gas main and, accordingly, to fuel leakage. But, Lehr engineers moved forward, and soon the American organizations BoatUS and Boat Owners Association tested their new products and compared them with gasoline counterparts. The results showed that the outboard motor on gas in all respects is not inferior to the gasoline counterparts. And, although the smallest Lehr 2.5 hp proved to be the noisiest among the gasoline counterparts, he moved the test ship at a slightly higher speed than the Mercury of the same power. As a result, small Lehr engines immediately found their niche and are installed on sailing yachts and small fishing boats. 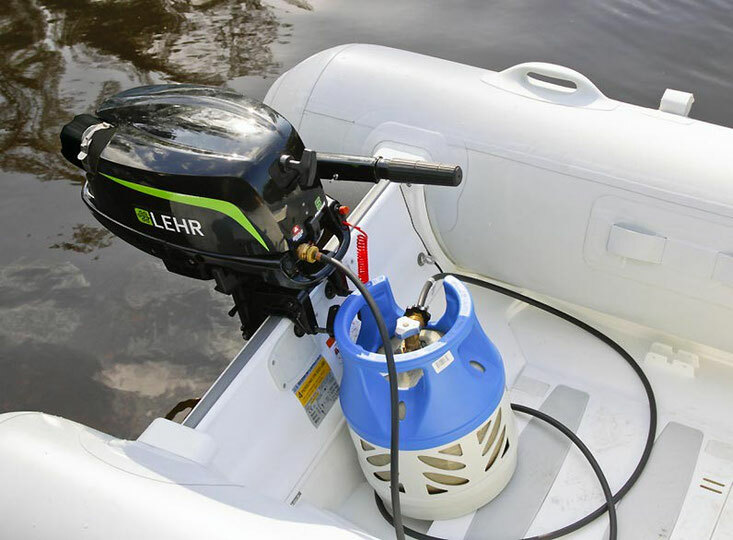 Today, the main goal of Lehr is to develop a complete line of outboard motors up to 115 hp. Boat engines for gas with a capacity of 2.5-25 hp, developed by the American company Lehr Outboard, will be of interest to many as a possible alternative in water bodies where the operation of gasoline engines is prohibited, as well as to all those who dislike the smell of gasoline in the cabin when transporting the engine and his tank. On the propane cylinder 0.5 l and 3000 rpm. 2.5 hp engine can work 2.5 hours. The fact that, although the boat engine on gas was developed in Los Angeles, the main assembly plant is located in China ... can be a spoon of tar from a propane tank.